The Ethertronics® ETH-MMW-1000 is a fully anechoic millimeter measurement system capable of testing wireless devices from 18 to 75GHz. 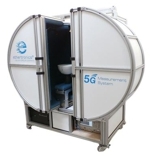 The system is self contained, moveable, and compact enough to fit into any laboratory or production environment. Posted in Product News and tagged AVX, Measurement Systems, mmWave.